I'm not exactly a "new member" per se. I joined the forum a couple years ago, but never really did anything. But I figure this is a good a time as any to introduce myself, if I didn't do it when I joined. 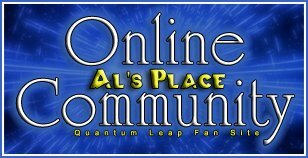 I'm Mike, I'm a Quantum Leap fan, but I sort of leap in and out of being super obsessed with it. And I really like this site, and the forums too. Last edited by feldon30; 04-01-2014 at 10:19 PM. Always glad to have members a-board.